Knight of Swords says brainstorm new thoughts without judgment or censorship. The inspired mind does not want to be limited, restricted or restrained in any way. A mind which has newly mastered creative – intuitive thinking has good intentions, but its attitude can be a little overbearing. Eagerness suggests innocence – one who has never lost a battle and still directs all energy outward – one who has yet to face the “fear” of being quietly alone with “self”. You can expect to feel the strength of this mind now – it will help considerably as you move through this difficult period. Someone favors you – they will defend you and promote good vibrations. Focus all your energy on making your point – communicate your thoughts, philosophy and ideas. Speak out and tell people how you feel. Each new moment creates an opportunity to fulfill ever changing needs. Be assertive and courageous – your faith will overcome any fear through the energy of your emotions. Release yourself from this confining or suffocating situation. Express your emotions and allow the power of these emotions to release you as you rise to the emotional level of your situation. You may “feel” inner conflict – but your emotions are beneficial and will be clarified once you have severed yourself from this negative situation. Allow yourself to experience the “true” situation – there is support available. Formulate your idea into a workable solution, apply your thinking – test your idea out and measure its worth. Mental, assertive, perfectionist, protective, philosophical, studious, alert, direct – a knowledgeable leader. Change agent for ideas and ideals – ruled by the drive for expansion. Missionary for ideologies and the mental work of religious expansion. Action-oriented, new methods, mental investment, investigative, law enforcing. Mental recreation, gambling/risk taking, curious, highly informed, cutting edge technology. The expansive side of things mental and represents formal education/training. Defender of ideologies, student of philosophy. In the first position: Between being the defender of ideologies which already exist and being the change agent for new ideas and ideals, you promise to be a very busy person. In the second position: In some cases this can be a young person on whom you must rely. Otherwise, this is your own mental energy and your ability to position yourself ideally in physical/material matters. This is the mark of a good tactician, a knowledgeable leader. You operate with the latest information and technology. Your factories will never be outdated any more than you will. In the third position: Think well on this card for it is coming to you in one form or another. This is the extra manpower, the added energy, the new resources, the movement that you have needed. This increases your store of knowledge and your ability to retrieve and use it. In the fourth position: As with the kings, this archetype can become distorted and block rather than foster love and creativity. At one extreme, the figure is idolized and idealized and real life will find it hard to compete. At the other extreme, the figure is loathed and by extension either all youth or all of certain types of youth are not to be loved/trusted. In the fifth position: This knight has your attention, either in person or influence. New mental factors, new input is anticipated to change the status quo. You may be asserting your position, making your thoughts known. 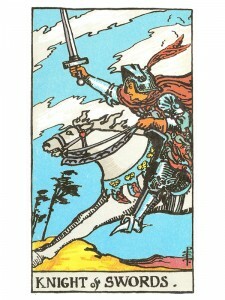 In the sixth position: The Knight of Swords may be arriving in person in the near future. Whether felt as a refreshing breeze or more like a hurricane, this is a positive wind breathing new life into your emotional/creative affairs. Openness and extroversion will prevail. In the eighth position: The knight is in your physical house. You should be able to feel the winds of mental change. There may be calculated risks being undertaken. Anything not set in concrete may be moved and those things that are set in concrete may get left behind. In the tenth position: Here is the support, the energy and resources that you need to invigorate your Mental Plane and it may well come in the physical personage of the Knight of Swords. It may, however, be the access to what he/she represents.